This quilt is going to be a small queen/large double at around 80 inches square, if I dont add borders to make it a proper queen. Now, I dont have a long arm, or even a large-throated machine. So figuring out how to quilt a monster quilt was a task I left for after all the blocks were pieced. I needed a soloution that wont bore me to tears or cause my upper body to be sore for a month. After some research, I finally decided on doing a quilt-as-you-go method. I hope it'll work. The above photo is a single block (16in square) quilted and ready to be joined to another. 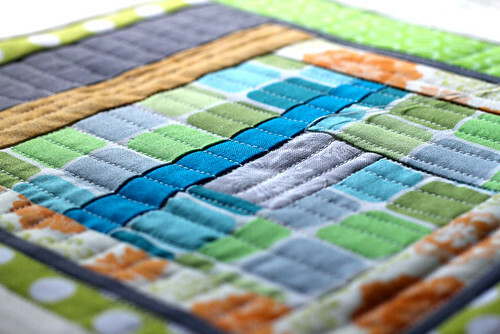 1/2 inch spaced quilting lines, in different directions to give it a little texture. I'm in love..and they dont take that long to quilt! an hour or so each block seems like good time versus shoving and tugging a queen size through the machine for who knows how long..!